Home|SINGLE BARREL VERSUS SMALL BATCH BOURBON: WHAT’S THE DIFFERENCE? As with grapes and wine, the raw materials that you start with when making Bourbon certainly have an impact- however, bourbon becomes truly refined and changed after a long period of time locked inside of its barrel. It is only after its “aging” period that the bourbon acquires its velvety smoothness. At the start of any distilling venture, distillers work tirelessly to analyze the method by which they mature the product, and once they have found a sweet spot in their process, they are able to produce a product with relative consistency. But beyond the process, the secret is truly in the cask. Therein lies the difference between single barrel and small batch bourbons. Single barrel bourbons come from a particular barrel, which is usually hand picked by the master distiller based on the degree of fullness and richness in terms of body that it can lace the bourbon with. This is the most basic point for distinguishing a single barrel variety from its small batch counterpart, namely the former is the product obtained from one barrel only while the latter has its origin in several barrels. Given this fact, patrons of single barrel bourbon are those who are looking for a specific flavor, taste and finish characteristic of the barrel in question, which cannot be imitated or acquired by any other barrel. Hence, it is natural for single barrel bourbons to be extremely pure. Those who seek out this variety of bourbon tend to take a more classic approach to the drinks, seeking to have it as unaltered as possible. Today, a number of distilleries produce single barrel bourbons as a part of their inventory. These are acquired from one barrel only and subsequently bottled without being combined with anything else. So each single-barrel bourbon is a distinct entity in the sense that it is representative of the unique flavor emanated by the wood – no two single barrels will ever taste the same. Difference in outcome also depends on factors like duration of maturity, placement of the cask and attributes and grading of the wood. The world’s first single-barrel bourbon was Blanton’s which was introduced in 1984 and it remains a popular choice even today. Today, connoisseurs of this beverage have a range of single-barrel bourbons to choose from that include brands like Wild Turkey, Elijah Craig, and Jack Daniels. Elijah Craig single-barrel bourbons have a relatively strong ‘oakey’ and ‘smokey’ flavor compared to the others while Wild Turkey’s famed single-barrel bourbon, Kentucky Spirit has a distinct chocolate flavor and spicy richness. 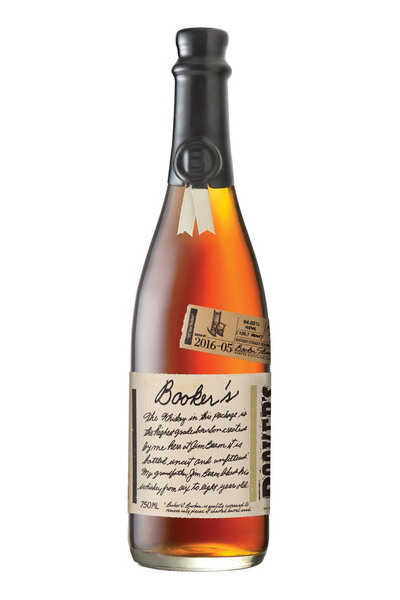 ‘Small-batch bourbon’ as a phrase rose to prominence with Jim Bean’s introduction of its famed bourbons namely Booker’s and Knob Creek. But how is it created? In the event that the master blender finds at his disposal several barrels of exceptional bourbon, he can use his discretion to mix content of all or some of these barrels to create perfectly crafted “small-batch” bourbon. This is a standard practice followed by many distilleries including Jim Beam whose popular “small-batch” bourbons include Baker’s, Booker’s, Knob Creek and Basil Hayden. As a result of the blend, the outcome is an essentially unique beverage that boasts of its own distinct personality. Essentially, when bourbon from several barrels are ‘married’ together on the basis of their ability to complement each other, the product of the union is small-batch bourbon. Another interesting point in the case of small-batch bourbons is the numbers of parent bourbons, which might vary from a minimum of two to a maximum of 80 or more as per the imagination of the master-blender. Some distilleries label their bottled bourbon with details such as batch number, date of bottling, and number of barrels used in order to help customers comprehend the difference and eventually make an educated choice. It is the batch number that is usually assigned to a particular batch of bourbon to distinguish it from the product of another set of barrels. As a visitor or customer you can use this information to find whether the bourbon in question is a virgin, meaning single-barrel, or a hybrid, meaning small-batch. But if you are a bourbon lover who is out on a night of experimenting, I always advocating trying both single barrel and small batch bourbon to make your own determination as to which one is best! Good story, but there are a couple of things to clarify. There’s no standard definition for how many barrels can be considered “small batch” — depending on the distillery, it could be a dozen or 12 dozen (144). That’s not a problem with the post…but with the industry. Second, with reference to Blanton’s as the “world’s first single barrel Bourbon” — I used to think that and write it as well, until I found out that Brown-Forman was selling a single barrel version of Old Forester in the 1950’s and 60’s called the “President’s Choice.” George Garvin Brown II personally selected each barrel, and it was sold by the barrel to celebrities and what we would call today “high net worth individuals”. They stopped selling it after Brown died in 1968. I had the chance to try a bottle that was distilled in the 50’s last fall with Chris Morris, and it was one of the best whiskies I’ve ever tasted. I’m worried that these definitions of bourbon are breaking down, and that the marketing of “small batch” and “single barrel” will be combined with new “artisan” terms to change and destroy the meaning of all of it. Just like “Chef’s Choice” in food has come to mean “whatever we’ve got leftover in the kitchen,” “small batch” can be a hodge-podge of almost anything. It allows the distillery to pawn off their lesser-quality or less-aged bourbons, and then turn around and charge even a higher price for it. This is made easier with the new labeling practices where you really don’t know what you’re getting or what its age is anymore. My worry is that with the market as it is, and with many more fashionable bourbon drinkers who are confused and deluded by trendy new bourbons and double-speak by distillers, is that not only will the prices go up, but the quality will go down and be less consistent. This is a worry I share. I’m all for capitalism, but some things dont need to be mass produced. I have even heard of companies experimenting with artificial aging (!) You spoke of ‘trendy’ new bourbons, whats your take on the rise of flavored bourbon whiskeys?